There was a not so recent blog post about the ideal button size of touch screen control sizes (sorry there is no link, the website is now a spam trap) that was based on the study form the MIT touch lab that gives some measures of the size and sensitivity of the finger. As the author of the blog pointed out, this ideal contact size is much larger than the suggested size for Windows and Apple devices that is in their design guides. I am wondering why there is such a difference, and whether it makes more sense to increase the size of controls on touch screen applications, or if this is not really a usability issue at all? Also, it seems that many mobile websites and apps seem to completely ignore these principles. I am sure the screen size poses a limitation to how big the interface controls can be, so is this simply a trade-off between being able to fit in as much information versus how easy it is to interact with the control? It feels as if the stylus is not something that is in much use. A similar question has been raised on the minimum/smallest size that you can get away with, but I would consider this to be a different question to what the optimum size should be, because the smallest size accommodates the minimum usability requirement, whereas the optimum size caters for the best usability requirement. UPDATE #1: another new reference that has a very precise figure of a minimum of 44 x 44 points, not sure how it is derived exactly but interesting (http://babich.biz/pagination-best-practices/). Read Section 2. Provide Large Clickable Elementss. UPDATE #2: another reference, this time from microsoft citing touch target size to 9 mm square or greater (48x48 pixels on a 135 PPI display at a 1.0x scaling plateau). They also suggest avoid using touch targets that are less than 7 mm square. UPDATE #3: something from the Apple Developer Guidelines that I referenced recently citing 44 x 44 points. Yes, size can be an issue. 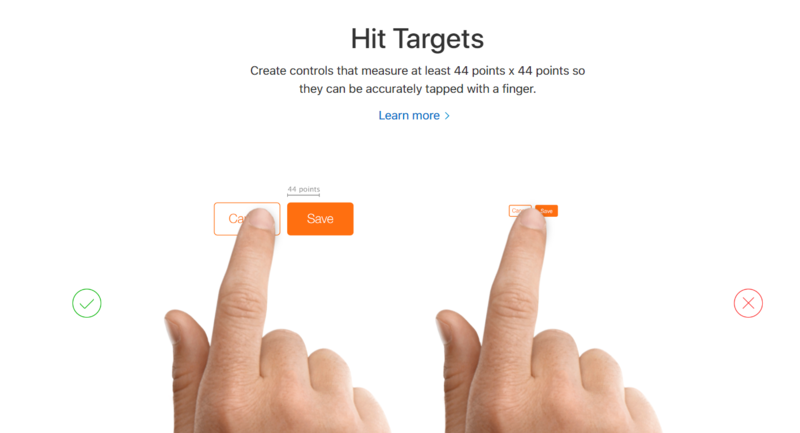 Touch targets need to be bigger than typical desktop targets because the finger precision is worse than the pointer+mouse precision. With this worst precision the odds to do missed taps is bigger (like not touching a button or touching the incorrect one). Usually, touch studies use as principal study variable the error rate. The suggestions are not for perfect error-prone touch targets, but rather to minimize the number of errors to a practical level while balancing other important variables, like screen information density. In traditional touch interfaces, like kioscs, targets are usually a lot larger than in mobile phones, because the size of the screen lets the designer do this. In mobile phones some trade-offs need to be made, and this is the reason because some target sizes differ between style guides and past studies. 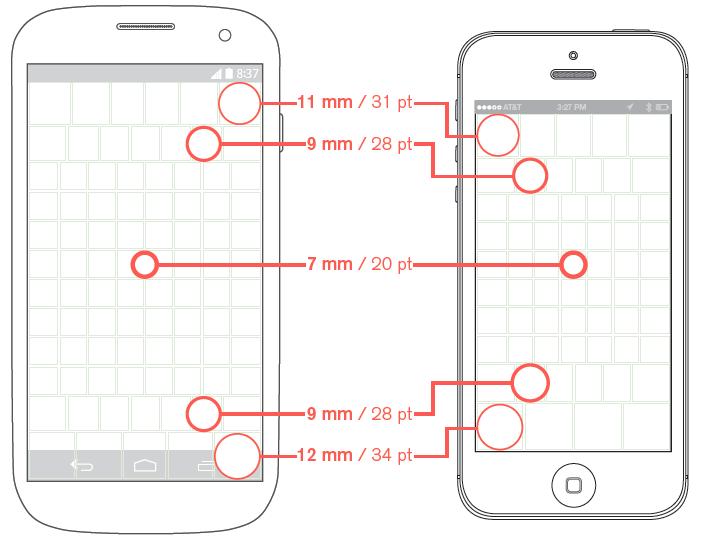 Any measurement in pixels is not useful to design for touch interfaces. You must consider the human finger size in relation to the screen pixel density. You must know the pixel density of the devices you are designing for and convert the metric units to pixels. The optimal touch target size, without considering any other variable, would be the theoretical infinite size, but it's usually suggested in style guides to use a general target sizes of 9mm (0,5% missed taps) and 7mm (1% missed taps) as a minimum. Luke Wroblewski has a good compilation of style guide recommendations, and I would suggest you to have a look at Microsoft recommendations (based in user testing sessions). Missed taps graph is from their studies. The guidelines given for the various platforms are all based on the idea that the minimum size should be 9-12mm. The variation between the guidelines is mostly due to differing pixel densities on the devices, and hence different number of pixels needed to reach the 9-12mm figure. Note, that this isn't an ideal dimension to make the button easier to use, but what you should never go below. In practice, however, due to space constraints it often ends up being the standard size that is used. What the 'ideal size' is really depends on the application. I worked on one mobile application where three buttons in a bottom aligned actionbar had to be used very often. By increasing the size of the buttons by about 20% we found a measurable improvement in the UX. This was important enough for this application that we were willing to give up some space for the bigger buttons. In other applications this may not be a good tradeoff. I think just as important is padding between buttons and where the button is located on the screen. Some advocate that due to phone cases it is difficult to touch buttons at the edge of the screen. Due to the large size of smart phones currently in the market one handed use is probably on it's way down, but it may still make sense to consider reach of a thumb and at it's limits or motion it is less accurate. This image from an article on mobile device usage illustrates it quite well. Finally as someone already mentioned use case matters equally if not more-so. If the app is for snowboarders, consider it's use with ski gloves (at least the conductive ones made for touch devices) and if it is for young children still developing motor skills larger touch zones and padding is prudent. I've battled with people quoting this finding on several projects now. The discrepancy, imho, exists because of the researcher's ability to exist in a controlled environment. When you have complex pages to deal with, you can't make every tapable action the size of a large man's thumb print. If you did, you'd end up with a cluttered mess of a UI. People are more adept with their touch devices than we sometimes give them credit for. For critical actions, I've found anything from 9–12 mm square (or wider) to work reliably. For secondary and tertiary actions, like small icons or text links, I just make sure there is no less than 6 mm square. "In traditional touch interfaces, like [kiosks], targets are usually a lot larger than in mobile phones"
There's not going to be a single optimum size in px or mm, as it depends on how the user is interacting with the interface. If they're liking going to be sitting still, such as a news reader app, then you can afford to make the buttons a smaller. If they're likely going to be in motion, such as a workout timer clock, then you're going to want the buttons to be massive. I like the approach of collecting data on % of misses vs size, though you'll get a different result set depending on the scenario. Also, I think time to press would be important. I may not miss the button, but it may take me undue time in stopping my body motion to press the button. Not the answer you're looking for? Browse other questions tagged usability gui-design buttons touch-screen size or ask your own question. What size of a button can a reasonably fat finger comfortably click? Is there any difference in element minimal sizes on 10 and 24 inch touch screens? Why are UISegmentedControl's height a default of 28 points? What is the optimal QR code size on screen? what is the best document size for wireframes? Symbol for long touch button? What is the best solution to solving nested, referenced documents?